An annual publication accompanies the “best architects” award, compiling the award winners together with their architectural projects. The latest edition, “BOOK – best architects 16”, was created against the backdrop that the award itself allowed submissions from all over Europe for the first time. On 424 pages, it presents the 89 winners subdivided according to the six different award categories. 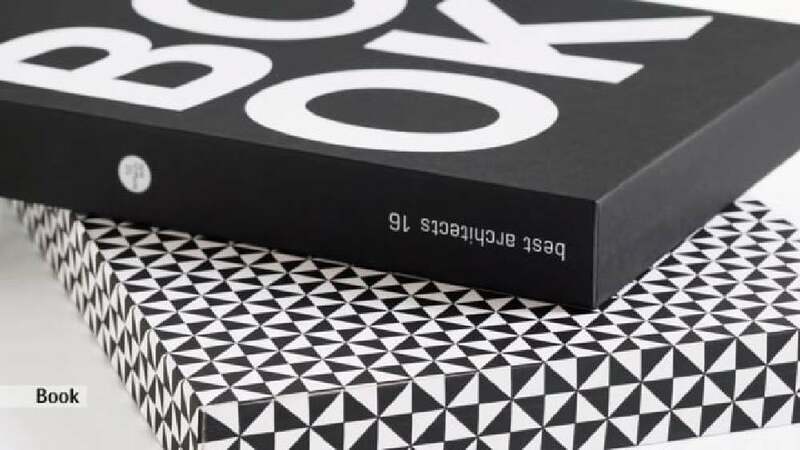 The design realises the concept of removing the title from the book and transferring it onto the accompanying slipcase. This allowed the book itself to be covered with a geometric pattern on all sides. The result is an exciting optical irritation that challenges the spatial perception of the viewer. Each award-winning project is presented on two doublepage spreads featuring photos, carefully sketched plans and descriptions. Thus, the book gives a good overview of the current best works in the architecture scene in Europe. This book has an invigorating effect and allows delving deeply into the world of contemporary architecture. It fascinates with an appealing page layout, a well-balanced selection of photographs and a typography that guides readers through the pages with ease. A consistently realised concept that convinces as a whole, completed with a cover design idea that is particularly outstanding.